In Tegucigalpa, Honduras, 19-year-old Gabriella works in a sweatshop at least 15 hours a day, seven days a week, earning the equivalent of $26 US a week. Her husband was recently robbed and killed by bandits, and her mother died of cancer. She is the only adult in her family. Her 10-year-old stepsister looks after her toddler in a tiny second-floor room, accessible only by a ladder that leans on the outside wall. If her stepsister goes back to school, Gabriella’s child will be left alone all day. If she doesn’t attend school, she, too, is destined for the sweatshop. Heymann is North America’s pre-eminent expert on the plight of working families. 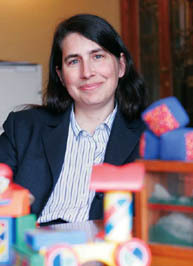 In July of 2005, she came to McGill from Harvard, where for the last seven years she and her team have conducted thousands of interviews with families in the United States, Mexico, Honduras, Botswana, Vietnam and Russia, analyzed survey data from households in eight countries and reviewed laws and labour codes in 170 countries. The results were published this year in Forgotten Families: Ending the Growing Crisis Confronting Children and Working Parents in the Global Economy (Oxford University Press). The developed world doesn’t necessarily have more developed social policies. For instance, Vietnam has made a commitment to early childhood education and has legislated sick leave for parents of children under age seven. As a result, fewer parents leave sick children home alone in Ho Chi Minh City than in Baltimore. Many of the problems facing poor working families stem from the fact that major social changes occur without the public policy adjustments that are needed to cope with the resulting upheaval. This past century has seen first the mass entry of men, then women, into the industrial and post-industrial labour force, and increased urbanization, which has taken people away from extended families. So far, Heymann says, social policy has not kept pace with the transformation in how society looks after families. By documenting what needs to be done and which social policies actually work, Heymann hopes her research will make it out of the university and into the hands of decision-makers. Already, her research on working poor families in the United States has helped reach those who need it most, providing the academic weight to the push that led to the country’s first paid sick leave legislation, in California. Dr. Heymann is the Canada Research Chair in Global Health and Social Policy.